There’s a large set of adjectives ending in -ine (derived from Latin) that refer to animals, among which the most common are canine, relating to the dog, feline for cat, bovine, ox, ovine sheep, and lupine for the wolf. Others are murine for mouse, leporine for hare, sciurine for squirrel, cervine for deer, and anserine for goose. Anatine is from Latin anas, a duck. I took refuge in wild theorizing, — if Angels be the next higher being from Man, perhaps the Duck had ’morphos’d into some Anatine Equivalent, acting as my Guardian, — purely, as an Angel might. Mason & Dixon, by Thomas Pynchon, 1997. Goosnargh (pronounced Goosner) is a village near Preston with a reputation as a centre of anatine excellence. 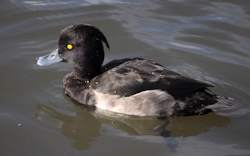 The Goosnargh duck is a white-feathered, yellow-beaked cross between an Aylesbury and a Peking. Last modified: 18 November 2011.